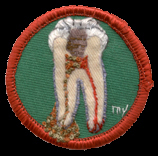 My female merit badges illustrate female "rites of passage" as well as the myriad physical manipulations women undergo to achieve cultural ideals of beauty, such as weight watching, whether or not to shave or wear makeup, etc. I've created tiny replicas of female products, such as a birth control pill pack and a pregnancy test. The miniature scale and meticulous, hand-embroidered surfaces convey my impressions of growing up female in our culture. My work has been featured in Ms. magazine, Harper's, Glamour, Surface Design Journal, Westword and other publications. 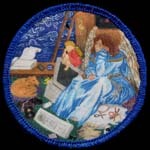 I was the recipient of a fellowship from the Colorado Council on the Arts in 1998. I've chosen 28 of the images that I feel are most representative of female experience for a color poster that can be ordered directly from this web site. It's 24 x 18 inches and is printed on heavy cover stock.